Avail yourself of the wide range of free music, movies, books, and other content available online: we show you how to download torrents on iPad, and you don’t even need to jailbreak. How to download torrents on iPad (and you don’t need to jailbreak). Torrents have long been a way for people to share content online: anything from movies to software packages, most of it free. While macOS users have easy access to torrenting software, it’s a little trickier on iOS. This is mainly due to the fact that dedicated apps are absent from the App Store, as some members of the public do have a tendency to also share illegal content via this method. Since we know that today tech tips readers are fine, upstanding citizens of the internet who would never countenance such behaviour, we show you how you can still download torrents on your iPad, all without needing to jailbreak it. It should be noted before we begin that due to the nature of torrents, and their dependency on users to supply the files, it can be a very hit-or-miss experience. So put on the kettle and maybe grab a good book, as your iPad might be busy for a while. The technology and practice of torrenting is completely above board. It’s a method that was devised to make it easier for people to share large files online and has been around since very early in the life of the internet. The principle is that files are broken down into smaller parts and downloaded simultaneously from several sources. These sources are comprised of users who host the files on their PCs, as well as traditional online servers. The practical upshot of all this is that the burden of supplying files is spread out, usually meaning downloads are quicker or at least remain available should one of the servers go down. The problem arises with the kind of content people share. Musicians, independent film makers, software developers, authors, podcasters and other creators have often used torrenting to legitimately distribute their work. But ripped files of the latest Hollywood blockbusters and chart-topping albums also frequently appear. Obviously, we don’t condone the latter, and would advise readers to also spurn this stolen material. Before you can download anything, you’ll need to find a torrent file. This is a special link which torrenting software can use to pull together the various parts of the target file from different servers (or seeders as they’re called). There are a number of torrent sites online, with the most famous being the Pirate Bay. For this guide we’ll be using Legit Torrents as it only features legally available free content, but there’s also the Internet Archive and many others available if you do a bit of searching. Go to your chosen torrent site via the browser on your iPad and search for the file you want to download. Make sure it has a healthy number of seeders (usually denoted by a column marked ‘S’, ‘SL’, or ‘Seed’): the more seeders, the smoother and faster the download. Tap on the item you want. It will either open in a new page or present you with a menu from which you should select Open in New Tab. When you have its full description, tap on the link marked Torrent, or Get Torrent, or something along those lines. Now the torrent should open and you’ll be presented with a pale document in the centre of the screen, bearing the legend Torrent written inside. In the bottom-right corner is the option to Download. Tap this. The document should turn blue and the option in the bottom corner will now be Open In… Tap this, select Save to Files, then put it somewhere you’ll remember and then open a new browser window. Using the torrent file requires dedicated software, but you won’t find any available in the App Store. Instead we’ll use a web-based alternative. Again, there are several to choose from. ZbigZ is very good, although you’ll need to create a free account if you want to download anything over 100MB. They all work in essentially the same way, in that you add the torrent file and the web engine does the work. For example, go to Torrentsafe and tap where you see the Add .torrent file option. Select Browse from the menu that appears, then navigate to your file. 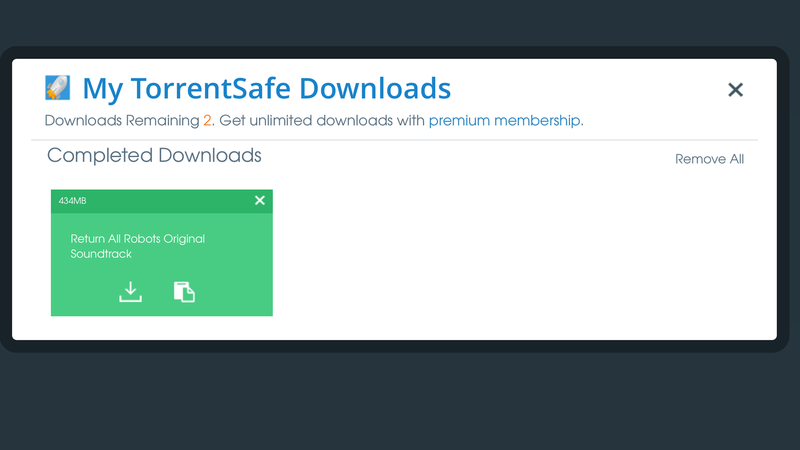 Select the torrent and you’ll see it pasted into the main box on TorrentSafe. Tap the blue Download Now! Button at the right side of the box and your file should begin its journey to your hard drive. Once the download is complete you’ll want to save it either to a cloud storage service, like iCloud, or to My Files on your iPad. 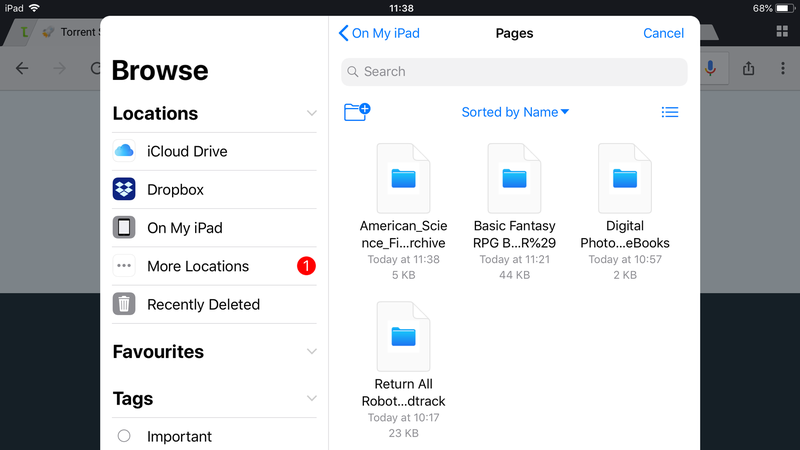 Now you can open the file with whichever app is most relevant. So video files will be something like VLC, music in, well, VLC too, and so on.